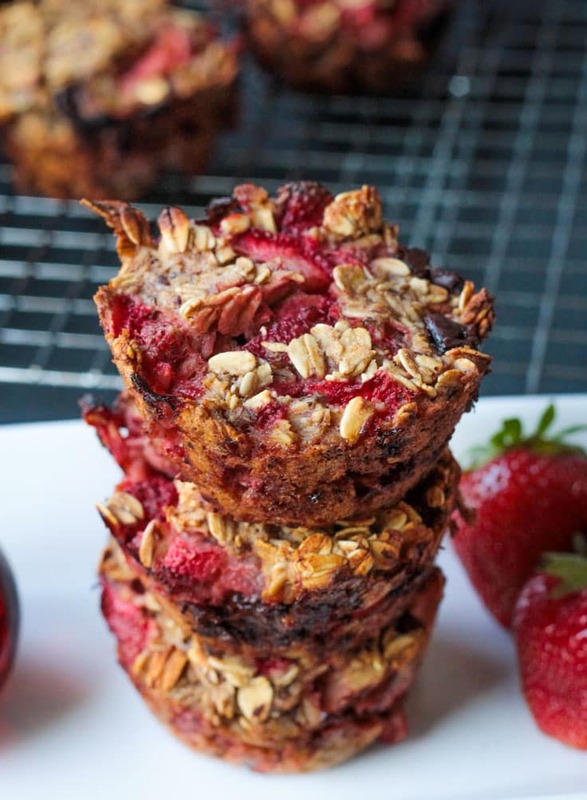 Banana Baked Oatmeal Bites with chunks of fresh strawberries and chocolate chips – a hearty, healthy breakfast or snack made with no refined sugars! I took the kids strawberry picking last week and we picked TEN lbs! The kids had a blast picking the best ones and I’m pretty sure they ate just about as many as they put in the basket. We definitely enjoyed our fair share of berries straight from the box. Fresh sweet strawberries were a side dish of every breakfast, lunch and dinner for several days after we picked them. But with 10 lbs, we had to get creative too. Since my kids love oatmeal so much, I decided to experiment with baked oatmeal to change things up a bit. 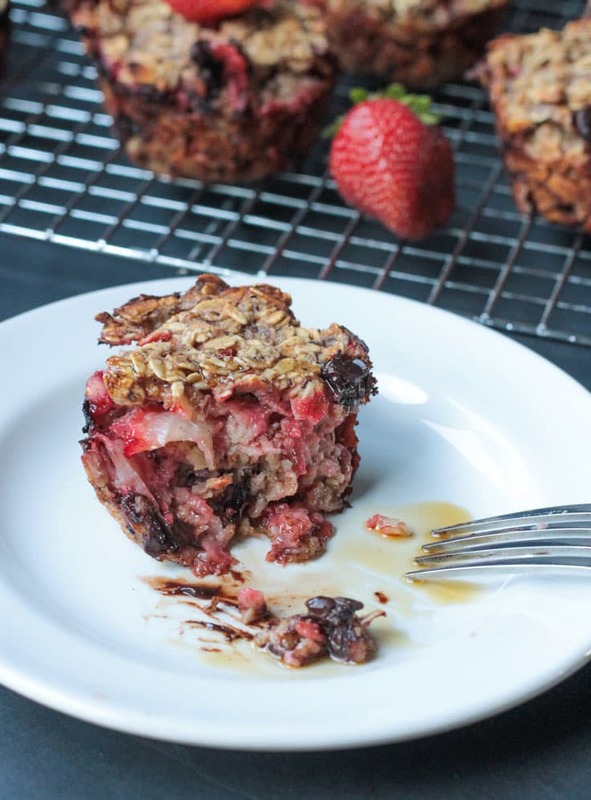 These Strawberry Banana Baked Oatmeal Bites with Chocolate Chips were a big hit! We enjoyed these not only for breakfast, but for snacking throughout the day as well. 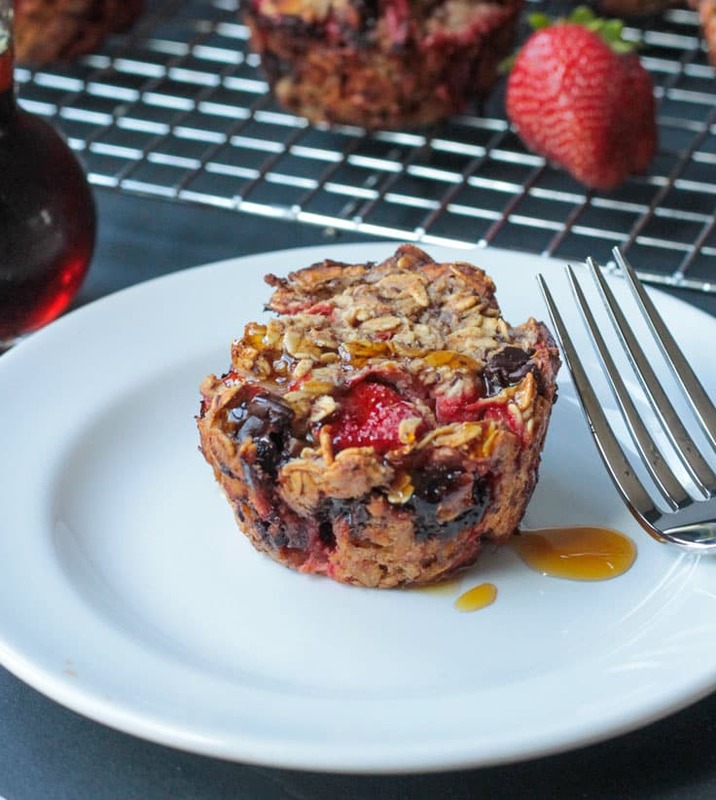 Our strawberries were nice and sweet, so there is NO added sugar in these baked oatmeal bites. I drizzled mine with a little pure maple syrup for some extra sweetness right before I ate it. 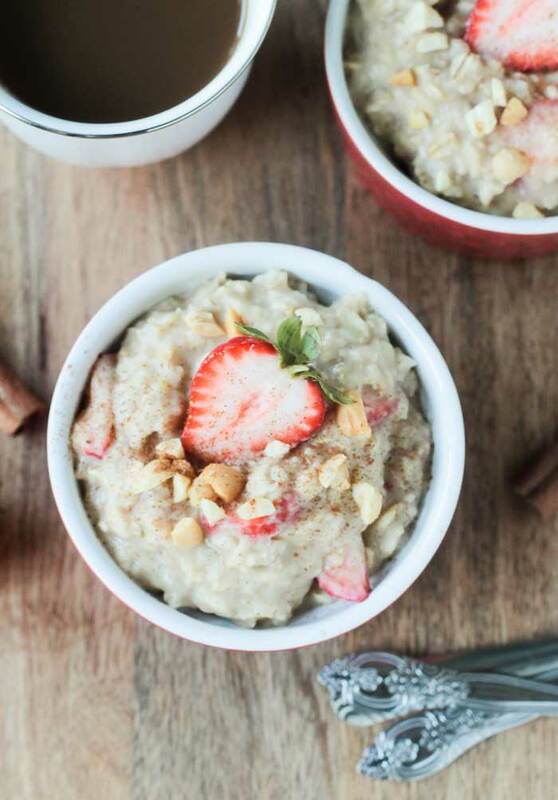 If you prefer your oatmeal on the sweeter side, or if your strawberries just aren’t that sweet, you might want to add a 2-3 tbsp of sugar to the mix before baking. My girls preferred them just as they are though. They liked that they could pick it up and eat it like a muffin. And, of course, they were THRILLED that I added chocolate chips! Chocolate really does make everything better, no? These would make a great snack to take along on a picnic or hiking or a day at the pool. Lots of nutrition packed into these little bites and it would be nice change from the usual granola bars that accompany those kinds of outings. Just beware that any chocolate chips on the outside of the muffins may melt in the heat so be sure to take along lots of wipes! 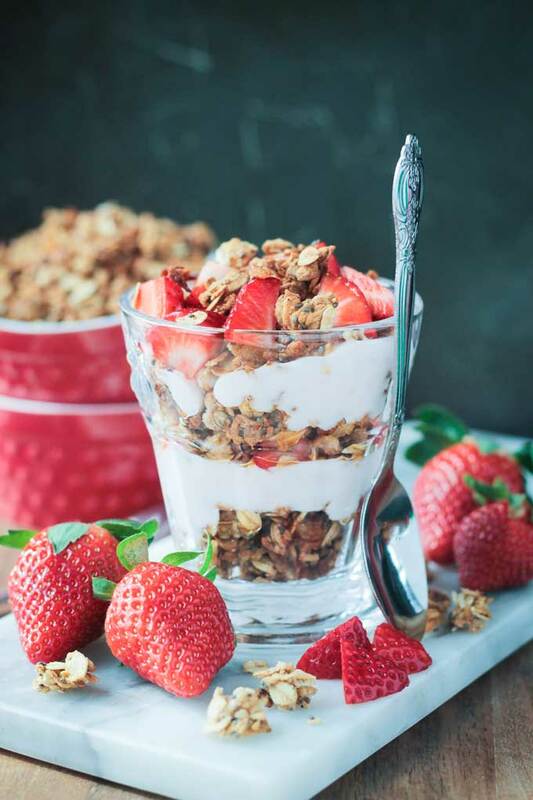 Change up your breakfast routine with these delicious hearty Baked Oatmeal Bites or enjoy them for a healthy afternoon snack. Either way, you can’t go wrong! If you give them a try, please leave me a comment below with your feedback and star rating. You can also find me on social media. Tag @veggie_inspired and #veggieinspired so I’m sure to see your post! Enjoy! 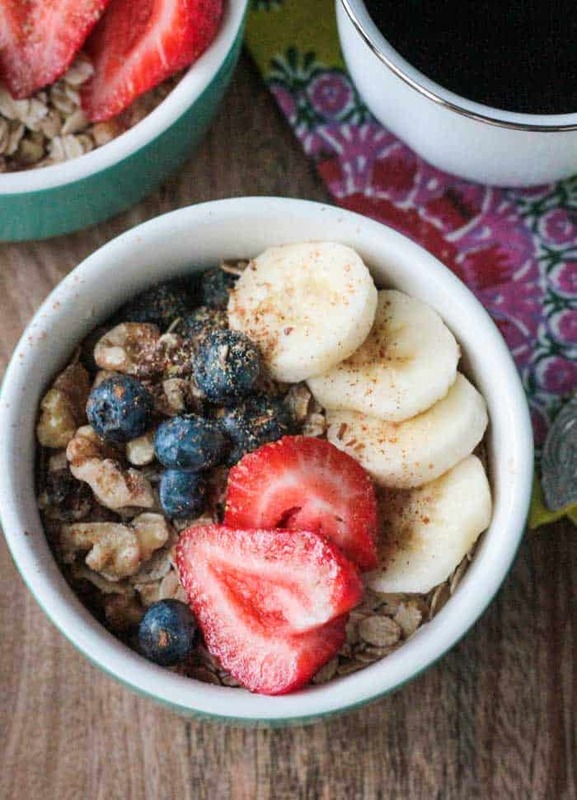 Hearty and healthy individual baked oatmeal that would be perfect for breakfast or an afternoon snack. They travel really well, too, so pack them up and take them with you on your summer adventures! Lightly spray a muffin pan with oil (I used coconut oil). In a medium bowl, whisk together the smashed bananas, milk and vanilla. In another bowl, combine the oats, flax, baking powder, salt and cinnamon. Pour the dry ingredients into the wet and stir until well combined. Stir in the strawberries and chocolate chips (if using). Fill the muffin tins to the top with the oatmeal mixture and press down gently to make them compact. Bake for 20-25 minutes until the edges are golden brown and the oatmeal is baked through. Let cool in the pan on a wire rack for at least 10 minutes.This will ensure that the oatmeal bites settle and hold together. 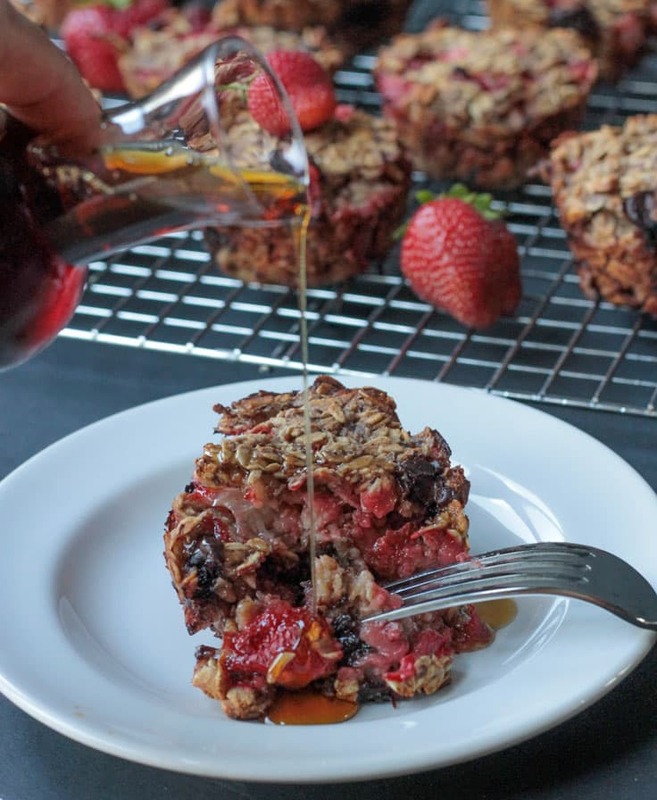 Take the oatmeal out of the muffin pan and enjoy! If you prefer your oatmeal on the sweeter side, add 2-3 tbsp of sugar to the mixture before baking. Or simply drizzle with a touch of pure maple syrup right before eating. « Lightlife Product Review: Black Bean Burger and Veggie Turkey Slices; And a Giveaway! Thanks for the recipe! what could i use to substitute strawberries? Hi, Emma! You can use whatever fruit you like best – blueberries, raspberries, diced peaches, etc. And the chocolate chips are optional if you choose a fruit that you don’t think would pair well with chocolate. Or, you can leave out the strawberries, not replace it with anything, and add more chocolate chips! 🙂 Enjoy and let me know they turn out! These look amazing! Any suggestions for banana substitute? Hi, Regan. The banana provides the only sweetness in these, so you could add some maple syrup instead…maybe 1/4 cup. Enjoy! Ohh these look good! I’m not much a healthy ingredients type person so what could I use in place of the Flax meal? Thanks! Thanks, Alisha! The flax helps to hold it all together, but you could probably just add a few more tbsp of oats and they would be fine. Or if you use eggs, you could add one to the mixture instead. I hope you love them. Let me know how they turn out! Yes, perfect for either!! Thanks, Ceara! These definitely wouldn’t need any additional sweetener with all the bananas and strawberries and chocolate chips, they would be just perfectly sweet! Of course a drizzle of maple syrup just makes them heaven! I love maple syrup and I love oatmeal. These are super cute and it sounds like your kids had such a blast! What a wonderful recipe. Thank you! A little maple syrup drizzle is never a bad thing, but yes, I do find them sweet enough with all the fresh fruit! I bet these taste as gorgeous as they look! I love how versatile these are! Strawberries are one of my favorite fruits. These are perfect on the go! Love when I find a recipe and I have all the ingredients on hand! Well, I need the strawberries, but that’s ok because I’m going shopping in a couple hours! Thanks for sharing this! Isn’t that the best! I love to shop my pantry!! I hope you enjoy them! These are beautiful! Definitely breakfast and snack material! And I love that they don’t have any sugar, especially because that gives me a reason to douse them in maple syrup 🙂 Pinned! LOL! Agreed! I much prefer to control the sweetness after the fact…sometimes I want a little, sometimes I want a lot. If you bake the sugar in the mix, you can’t decide later that you don’t want it! 🙂 Thanks for the PIN! These look delicious Jenn! Strawberry picking is on my agenda for Sunday. Weather permitting. Thanks, Linda! Where do you go Strawberry picking? You are in the Chicagoland area, right? We LOVE Tom’s in Algonquin, but they are already done picking for the season now. I think I’d be happy eating this everyday right now for breakfast! O yum and that maple syrup….perfect! Thanks! It’s definitely delicious with fresh strawberries and this is the season to do it! I’m sure it would work perfecting with frozen strawberries too, though, so we can enjoy this one year round!